me pa zanima kolk žarnic bi blo priporočljivo vzet za 40 kubičnih metrov, če ve kdo ? Miki-Kodeljevo je napisal/a: Jaz osebno uporabljam žarnico za terarij EXO TERRA Repti Glo full spectrum terrarium lamp, ki naj bi ponazarjala tropski deževni gozd in ima UVB 2.0. Globje v analize raznih sevanj se nisem poglabljal, saj sem s temi žarnicami dosegel skoraj vse kar je prej manjkalo. kaj ti maš tole miki ? Veliko ljudi ne ve, da imajo ptice bolj razvit vid kot ljudje zelo podobno kot bolj splošno znano dejstvo, da ima pes bolje razvit nos. Ptice so ene izmed vrst nad vsemi drugimi na tem planetu, ki so najbolj prizadete zaradi svetlobe, ki vključuje vrsto svetlobe, koliko časa so izpostavljene svetlobi in kdaj v dnevu. Papige zaznavajo in se odzivajo na celoten spekter svetlobe, ki ga ustvari sonce. Imajo zelo razvit vid in so od njega zelo odvisne, morda bolj kot katera koli druga žival. Svetloba ima zelo pomembno vlogo pri obnašanju papig, presnovo in rast. Zato je bistveno, da lastniki svojih ptic razumejo pomen razsvetljave papig za njihovo čustveno in fizično počutje. Ta sposobnost vida jim pomaga v treh primarnih dejavnostih, v njihovem naravnem okolju. K sreči imajo lastniki papig možnost, da ne nosijo kletke ven na sonce po več ur dnevno ampak obstajajo na tržišču full spectrum žarnice (polni spekter - imitacija sonca). Nažalost ne moremo postaviti kletke k oknu, da bi papige imele svetlobo, saj naše šipe filtrirajo UVA in UVB žarke, ki so nujni za dobro počutje in zdravje papig. Not many people know that birds have more developed eyesight than human beings very much like the more widely known fact that a dog has a better developed nose. Birds are the one species above all others on the planet that are most affected by light, which includes the type of light, the length of time exposed to the light and at what times in the day. Parrots have developed relying on the full spectrum of light created by the sun. They rely on their eyes heavily, potentially more so than any other animal. Light plays a major part in a parrots behavior, metabolism and growth. Therefore it is crucial that owners of their birds understand the importance of parrot lighting for their emotional and physical well being. Parrots are able to distinguish many more shades of color when in sunlight and this ability helps them with their 3 primary activities when in their natural habitat, that of spotting potential danger, mating rituals and probably the one activity that is used most and that is foraging for food, it is not that easy to spot a berry or fruit amongst the dense canvas of the rainforest!! Luckily for pet parrot owners there is a more convenient and less intrusive way to give your parrot the light it requires without having to physically transport your bird outside for hours each day and that is to place a full spectrum light near the parrot’s cage. Full spectrum light is light that encompasses the electromagnetic spectrum from near ultraviolet down to infrared, so all the wavelengths that have been found to be of use to both animals and plant life. Sunlight is considered to be full spectrum. 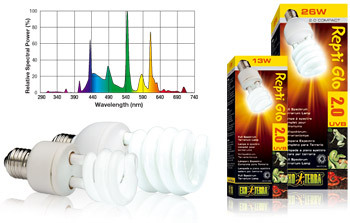 Full spectrum is not considered a technical description; it is a marketing term which implies a particular product that is comparable to natural light. Unfortunately you cannot place your parrot’s cage near the window in order to get the benefits from sunlight as domestic windows filter out UVA and UVB rays which are essential for your parrot’s health and wellbeing. Full spectrum lighting aids the natural synthesis of Vitamin D3 and assists the parrot to regulate it naturally. Vitamin D3 allows the digestive system to obtain calcium from their diet, helping the parrots beak and bones. Too much calcium can result in kidney problems and too little can leave a parrot with debilitating brittle bones, so for a parrot to be able to regulate their Vitamin D3 is very important and full spectrum lighting is a major contributor to aiding this process. Full spectrum lighting also has a positive effect on the glandular system of a parrot which ultimately ensures healthy feather growth and consistent molting and reproductive cycles. The full spectrum light should be placed no more than three feet away from your parrot and be switched on for a set time at the same time each day. Due to the proximity of the light and therefore light fixture to your parrot, you need to make sure that your parrot cannot destroy or dismantle the fixture and be able to hurt themselves or chew through the electrical cable. The exact length of time that the light should be on will be dependent on the parrot’s particular breed. The reason that recommended times should be followed are to prevent any adverse behavior from the parrot such as depression or aggression. The full spectrum light may indicate the length of time you need to expose your parrot to the light for. Most birds will be between 2 to 4 hours daily, however smaller parrots like canaries or parakeets will suffice on 1 to 2 hours and larger birds like many of the African parrots will require around 4 to 6 hours. The easiest way to make sure that your parrot gets the correct amount of full spectrum light or natural light exposure is to install a timer onto the lights plug so that you can automate the process and then that is one less thing you have to remember to do on a daily basis. You need to remember that the use of a full spectrum light is in addition to the natural daylight of your own environment as parrots require a balanced light spectrum and regular photoperiod. In their natural habitat which more often than not is near or somewhat near to the equator, parrot’s have developed and have become accustomed to between 7 to 12 hours of sunlight per day. Parrot’s use light to set their internal clock, control their metabolic rate and their endocrine system which is vital in keeping parrot’s healthy and happy. Parrot’s are acutely affected by their immediate surroundings and it is important that parrot owners create an environment that has a positive effect on their birds, everything from cage size and location through to the variety in diet and toys to keep them healthy and happy and one of the major factors on the parrots environment is their available light and its quality so you should spend some time and effort on choosing the best light that you can for your parrot and you will be rewarded with a happy and healthy pet for years to come. Koliko časa pa imate dnevno prižgane te žarnice, saj jaz imam prižgane od 5.30 ure zjutraj do 23 ure ponoči, mislim da ni preveč dolgo. idealni pogoji bi bili z full spectrum žarnico (eno ali več odvisno od prostornine) in če imamo povrh še toploto, se praktično lahko razmnožujejo celo leto, čeprav to ni ravno priporočljivo kolikor mi je znano. Najmanj 12 ur v letnem času pa tudi do 15 ne škodi. Glede na to da večina naših ptic izvira iz tropskih krajev je dan konstantno daljši kot pri nas nikoli pa krajši od 12 ur. In their natural habitat which more often than not is near or somewhat near to the equator, parrot’s have developed and have become accustomed to between 7 to 12 hours of sunlight per day. V naravnem okolju, ki je najbolj pogosto blizu ekvatorja, so se papige razvile in so se navadile na približno 7 do 12 ur sončne svetlobe na dan. The equator receives twelve hours of daylight, there's 24 hours of daylight at the North Pole. -ekvator prejema 12 ur dnevne svetlobe medtem ko severni pol 24 ur dnevne svetlobe. taka in drugačna obsevanja, tudi ljudje ne uprablamo redno. Dolžina dnevne osvetlitve prostora je pomembna predvsem zaradi pitanja mladičev in parjenja ptic nasploh. in kvaliteta prehrane, so približek spomladanskemu dalšanju dneva, višjim temperaturam in večji izbiri hrane. Za večino ptic, ki jih pripravljamo za razmnoževanje je priporočljivo, da preživijo nekaj mesecev v fazi naravnega počivanja. ker je full spectrum žarnica imitacija sonca naj bi bila prižgana maksimalno 12 ur dnevno, standard žarnice pa so za ptice dejansko skoraj brez pomena, kolikor kažejo znanstvene raziskave.